Every Door Direct Mail can drive customers to your business. An example of this approach to prospecting for new business comes from one of our latest mailers. We help a client locate customers within three town in the north Dallas, Texas area. This particular customer was looking for customers who where home owners with average household incomes over $60,000. Once the target area was identified we looked up the postal carrier routes and found the number of customer who met the clients criteria in each town. The result was an Every Door Direct Mailing project that went to Anna, Texas and Van Alstyne, TX. The piece we printed with offset printing was a full color postcard printed on 80lb gloss cover. 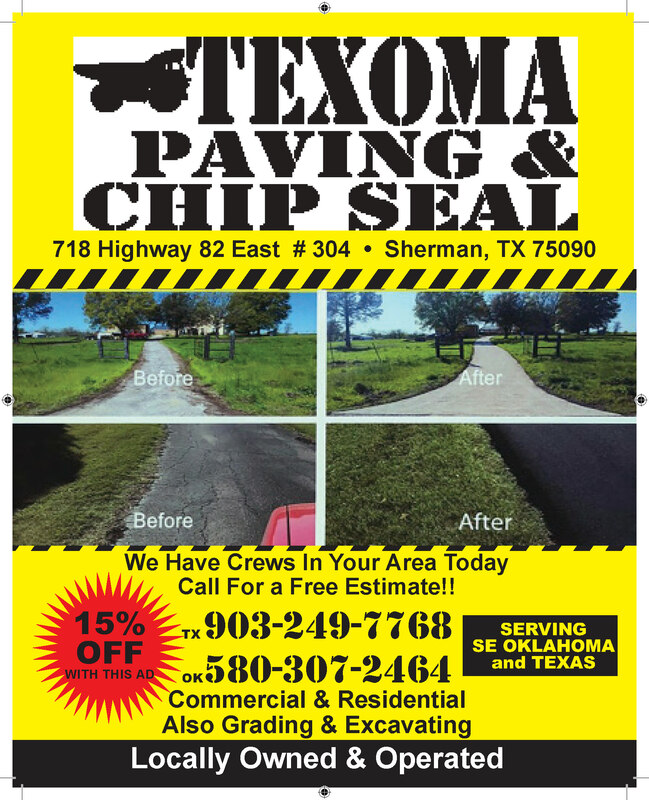 This particular customer happen to be in the paving business but the same can be done for a client who owns a car wash a restaurant or a dentist office. Every Door Direct Mail lets you advertise to your community for less! There are no mailing lists and no permit or addressing requirements. At the lowest postage rates, Every Door Direct Mail is the premier way to increase local business profits! Direct Mail doesn’t have to be difficult, expensive or confusing. Our team is dedicated to making it easy for you to design, print, mail, and get more customers. Planning a marketing mailing? We can help you design a makreting piece and find the potential customers near your business who matter most. Using the USPs online mapping tool, you can choose among postal routes based on demographics, then we deliver to every address on your selected routes. There's no need to purchase mailing lists, and with Every Door Direct Mail service, you reach potential customers for as low as $.175 per mailpiece. Every Door Direct Mail service is an easy, cost-effective way to reach potential customers near your business. A row of suburban homes with neatly manicured lawns. In other words, Just Click Printing can get you what you need, when you need it, at a fair, competitive price, and let you order from your computer, tablet or phone, with the best in online printing service. 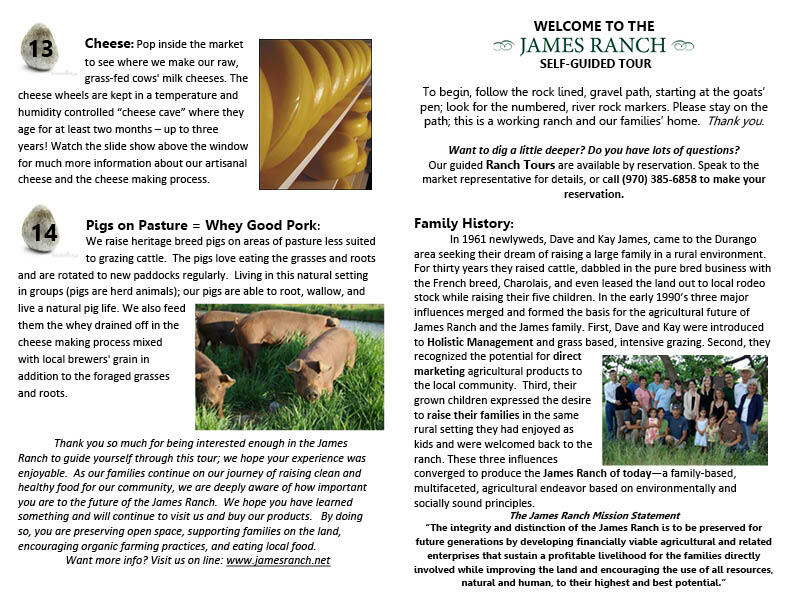 Just Click Printing, Durango & Farmington, printed 2000 8-page booklets for James Ranch. This job was printed with black ink on 60 lb. 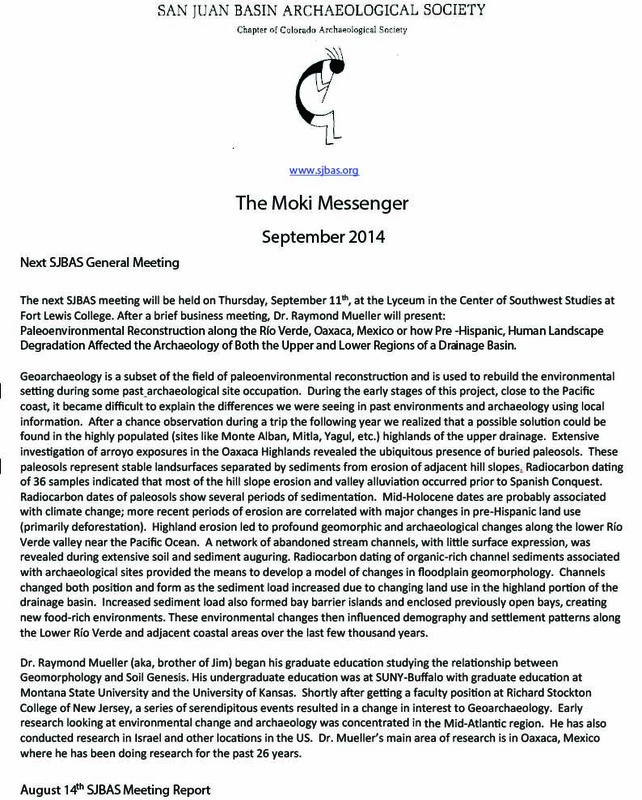 white paper, folded, collated, and stapled. James Ranch uses these to provide a self-guided tour of their ranch. 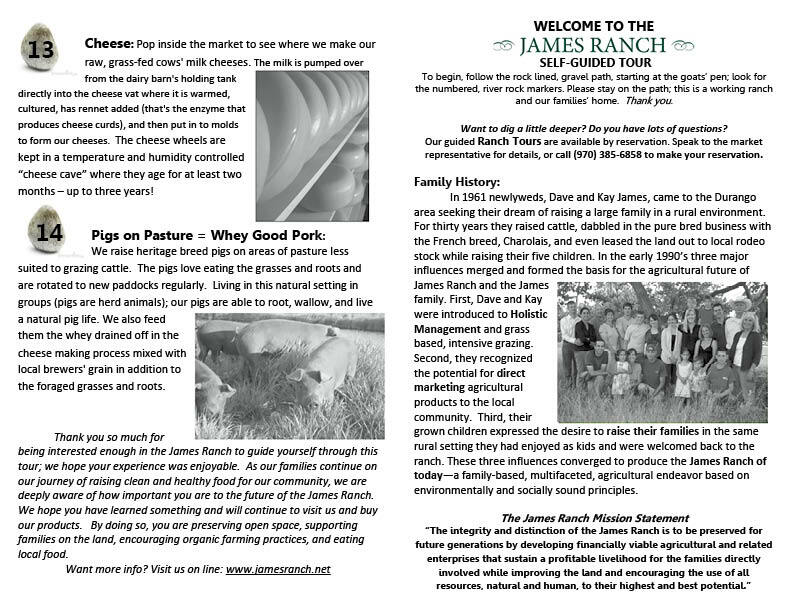 James Ranch is a Durango, Colorado, ranch that specializes in producing quality beef and dairy products, pork and garden offerings, that utilize organic, sustainable, grass-based practices. We have printed menus, booklets, flyers for their “Burger and Band” series, and other items for them. They provide a unique Old West service combined with the best food production and service practices. The entire Durango area is a great tourist destination, with mountains and rivers that provide hiking, sightseeing, rafting and other water activities, as well as railroading and numerous outdoor recreational opportunities. Just Click Printing is happy to serve the community and the surrounding Four Corners region with the best in commercial printing. We have graphic designers and printers to serve all your printing needs. Just Click Printing has printed in the Four Corners since 1983, thirty-two years of friendly, quality service to businesses and individuals. We have a great staff of friendly, experienced, and knowledgeable folks at 1305 W. Main St., Farmington, NM, and 450 S. Camino del Rio #104, Durango, CO (505-326-1344, 970-247-5228, 800-356-1344). Let us serve you. http://www.justclickprinting.com/ – Just Click us on line or in person. 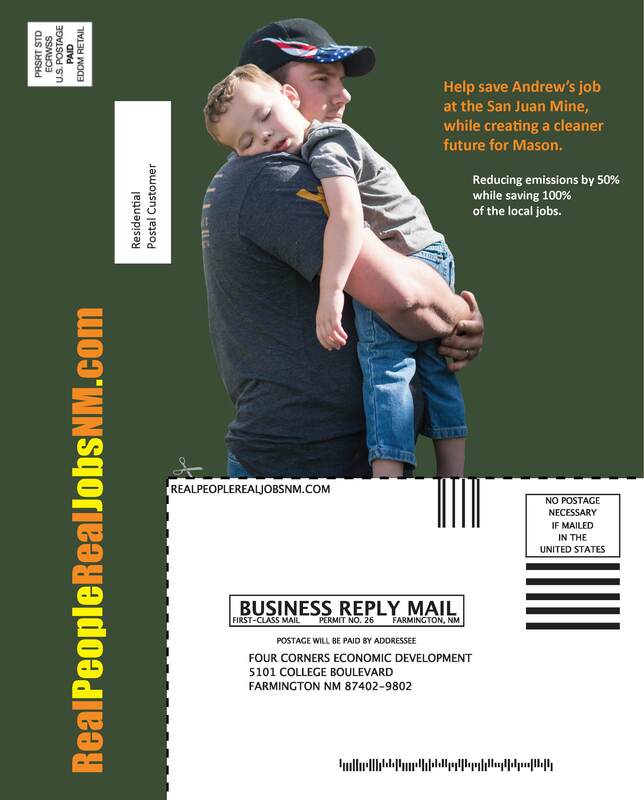 EDDM – Every Door Direct Mail Farmington, NM – Casey Construction put over 38,500 mailers in the hands of local residents. 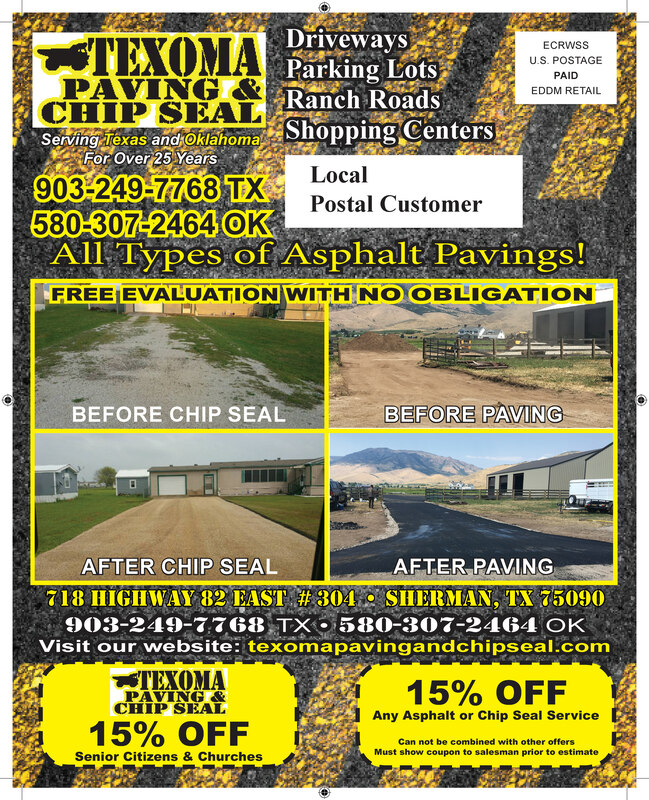 This mailing consisted of a postcard with specific information about a promotion and the work done by Casey Construction. 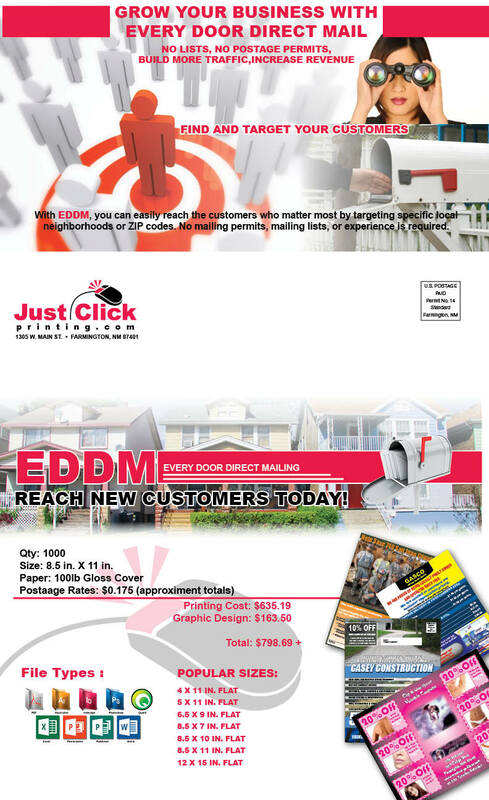 EDDM – Every Door Direct Mail is an important service provided by Just Click Printing for its customers. EDDM – Every Door Direct Mail Farmington, NM – Casey Construction is designed to reach the potential customers of Northwest New Mexico and Southern Colorado. This easy-to-use mailing technique can reach your customers effectively with the message you want to distribute, either as a business are organization. Whether you want to reach a small specific area or blanket an entire county, it would be good for you to investigate the benefits of direct mail to your business. This puts a mail piece with your information in the hands of potential customers – a win-win situation. 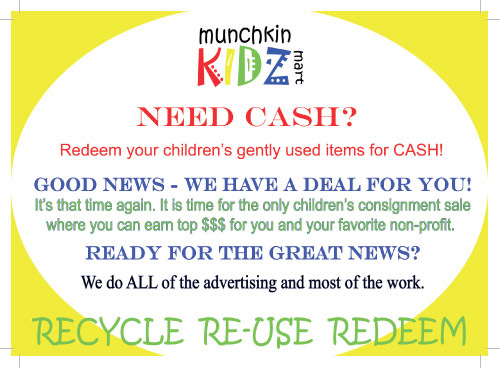 We design and mail these pieces to provide maximum impact for your advertising dollar. 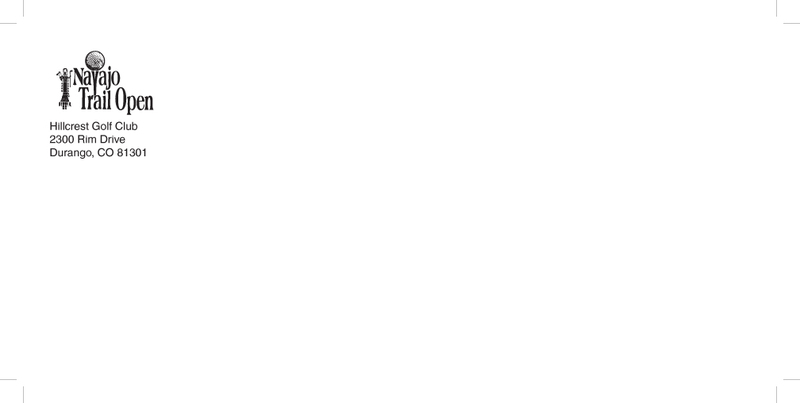 EDDM does not require a mailing list, a mailing permit, or any experience with mailings. It can target specific neighborhoods or an entire town. It is simple to initiate, a great way to contact new potential customers, and cost effective. Contact us for information or to plan your next advertising campaign. We give expert help to make your EDDM a success. Just Click Printing is the best contact in Farmington and the entire Four Corners region to make EDDM work for you. http://www.justclickprinting.com/rp_product/every-door-direct-mail/. 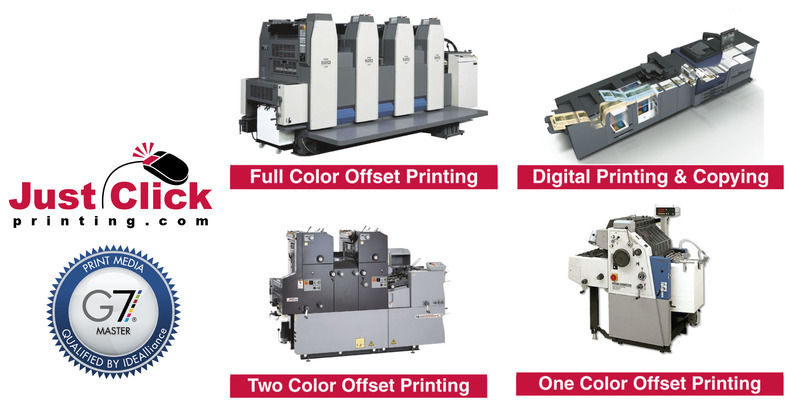 We are a full-service commercial printer for all your printing needs, with shops in Farmington, NM and Durango, CO, with full color capability, from business cards to brochures, to EDDM. 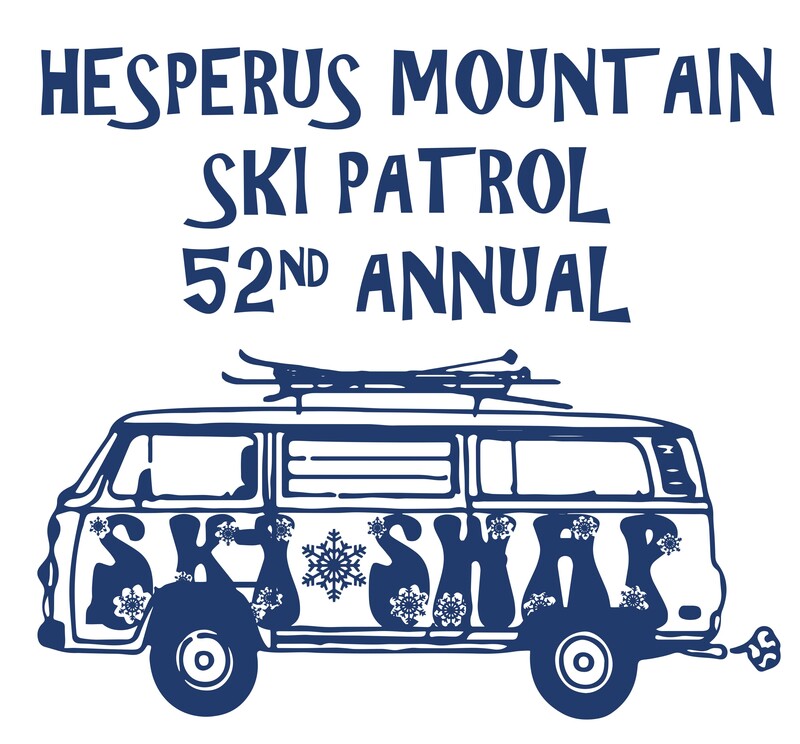 We also print T-shirts with either screen printing or digital garment printing. We have a great experienced staff to help you get started on your next great adventure. Every Door Direct Mail (EDDM) is a Winner. EDDM for San Juan Economic Development, Farmington, New Mexico, recently reached 35,000 residents of San Juan County. Every Door Direct Mail (EDDM) is an effective tool to reach everyone in a blanket area to get your message out. Just Click Printing recently printed and mailed these 35,000 pieces to residents of the county. San Juan County is an area larger than the state of Connecticut, and everyone received this postcard. 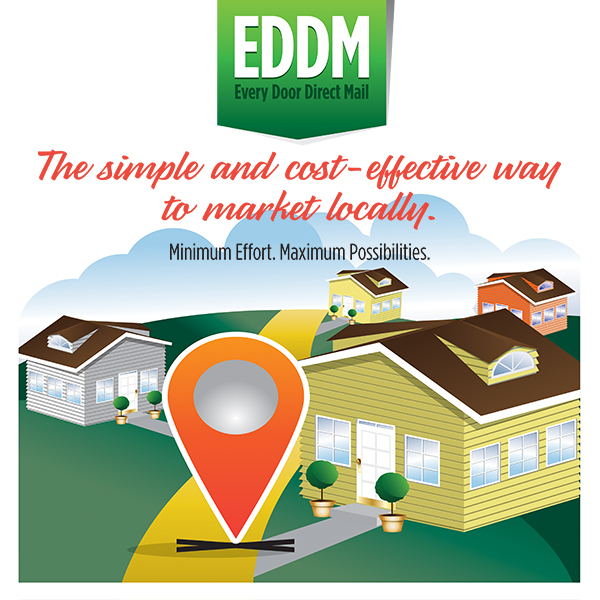 Every Door Direct Mail (EDDM) can cover an area as small as a single postal carrier route or as large as you might want. 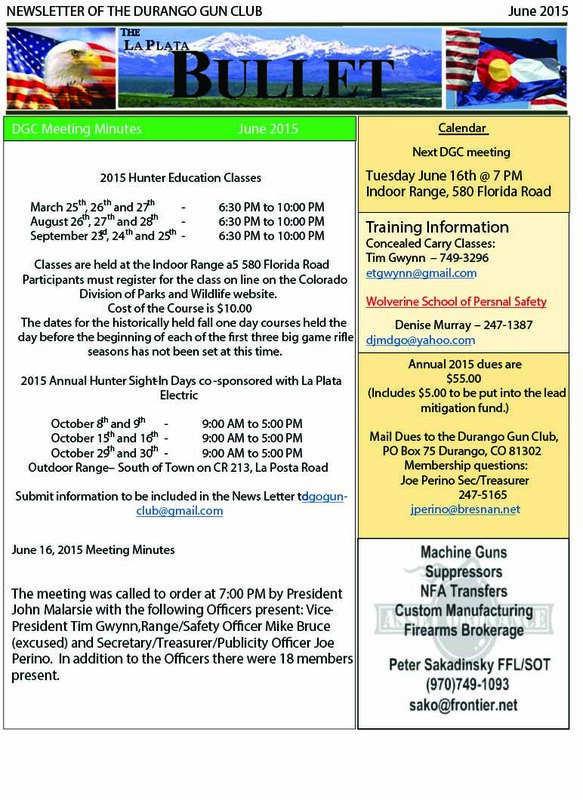 The mailer emphasizes the need to save the San Juan Mine and San Juan Power Generating Station, both large employers in San Juan County. Whether your business is large or small, Every Door Direct Mail (EDDM) can provide a boost to your marketing by reaching the people and homes you want to target. San Juan College and other major business and educational entities in the area want the mine and generating station to continue to provide jobs and income for the 1000’s affected by this issue, both workers and their families. Every Door Direct Mail (EDDM) is an important tool in this effort. Help with this cause if you can, and use Every Door Direct Mail (EDDM) to impact your business and the bottom line you want to further. Contact Just Click Printing (800-356-1344) for further information or to schedule your printing and Every Door Direct Mail (EDDM) project. We do full color printing and mailings, and we also do commercial printing of all kinds, from business cards to carbonless forms, letterheads, envelopes, booklets, newsletters, even t-shirts to help get your message out and serve your business needs. 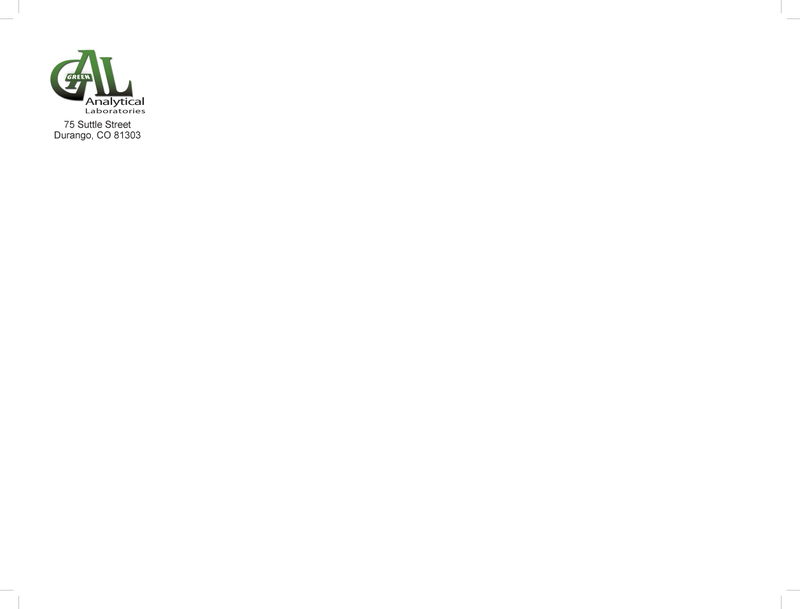 We would also be happy to do the graphic design on your project. We have facilities in Farmington, New Mexico, and Durango, Colorado, and we print for customers nationwide. We have excellent service, great prices, and an experienced, friendly staff to help you. Just Click Printing is an online printing service; that is, our website is interactive so that you can search for pricing, order your job, submit your files. We aren’t called “Just Click Printing” to sound good, but to let you know that you can click your mouse and order your jobs. Business Envelopes, #10 Regular and Window Envelopes are the standard white envelopes we all see so often. 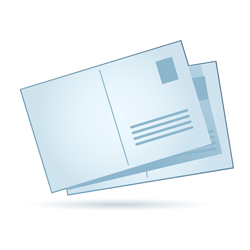 Just Click Printing prints envelopes as a staple of our business. Three of our recent envelopes are above. The Navajo Trails Open golf tournament envelope is a standard envelope, printed with black ink for the Hillcrest Gold Cluf of Durango, CO. The blue ink envelope above is for Colorado Timberline Academy, a local prep school in Durango, that serves young people from across the country. The center envelope is a 9 x12″ catalog envelope printed for Green Analytical Lab of Durango, CO. Just Click Printing normally prints envelopes in quantities of 500 or 1000, or multiplies of 500. A box of most envelopes is 500, a case is 2500; that is true of #10, #9, # 6 3/4 envelopes, whether they are white or a colored envelope. We print several qualities of envelopes, from standard white to linen finish envelopes, depending on the purpose of your envelope. A billing statement might simply require a standard white envelope while a business letter might require a classic linen or fiber envelope that makes a different first impression. Black ink or colored ink changes things again, it depends on what you need to say. Matching envelopes and letterheads might be just what a professional needs for some things, while a standard white envelope with black ink delivers an advertising piece or perhaps a bill as well as a more expensive approach could. The 9×12″ envelope (and similar sized envelopes) which normally come in white and manila colors have a multitude of purposes, to deliver or store and protect full sheet information that doesn’t need to be folded, to send documents or large advertising pieces, or any of 100’s of other purposes. As long a snail mail has or will exist, envelopes are essential. That probably means you need printed envelopes. Just Click Printing can design the logo and/or information you need or typeset your envelope, print it with the color you want, on the type or size of envelope you need. Let us help you get what you need at a competitive price, with quick turn-around, and friendly service. We print and ship nationwide, generally within a week of your order. 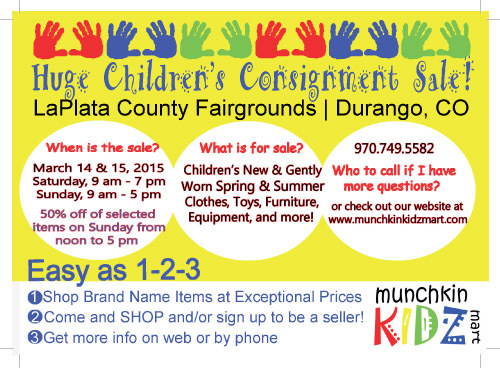 10,00 Postcards, printed 2 sides full color on both sides for Munchkin Kidz Mart, Durango, CO, are sure to advertize the March 14-15 , 2015, sale that is twice-yearly event in Durango for Denise and her crew at Munchkin Kidz mart. These postcards are 5×7″, printed on 16 point cover, 4/4 (e.g., full color on both sides), with full bleeds, and UV coating. We are helping her with yard signs right now, and will soon print Save-the-Date cards. We have also printed T-shirts for this company. We print postcards in all the standard sizes, some full color, some black and white. They advertise events, serve as sign-up cards, promote politicians, promote college classes, – You name it and a postcard probably has been used for it. 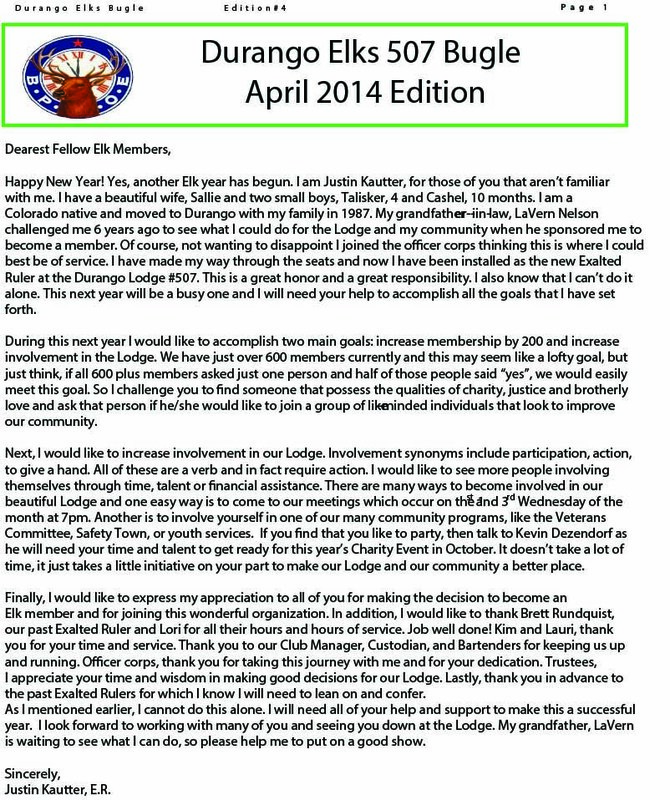 Send us your pdf’s or let us design and print postcards for you. we can even direct mail, or Every Door Direct Mail, them to your customers or contacts, or you can hand them out door-to-door as some printed for the latest election were handed out. It’s a big world out there and you probably need to be better connected to it. Postcards can help accomplish that. We are glad to help.